We squeezed time out into the Asian Civillisations Museum (ACM). ACM seeks to promote a better appreciation of the rich cultures that make up Singapore's multi-ethnic society. It's current exhibition presents the evolution of Buddhism through the art of India. Upon entering, collect a mini activity booklet at its reception, go through the exhibits and complete to redeem a little prize. The religious exhibits were a little too dry and heavy for Js to comprehend. The highlight for them was the Animal race exhibits. Where little ones were invited to embark on an exciting trail to uncover secrets about animals in art! This exhibition features interactive ensembles inspired by objects in the collection of the Museum that draw on artists' visions of animals in art across many cultures. We saw animals crafted in the various versions, forms and textures. We also learned more about the animal race in the Chinese zodiac, which animal came first and last, and why? Js love the interactive wall that introduces the food these animals eat, as well as their habits. There was also a small cosy corner for little readers to grab a book for read. These books displayed for browsing were much about our local places and cultures. It captivated Js, nonetheless. And next was the most interesting part of our visit. Any idea what other animal related exhibit would be put up? Don't think the conventional. Guessed it? Animals' poop! Ok, I promise you, no funny smell in there. Js had a grossed out time eeewwing and yucking to the various forms of poops on display. It's not to create disgust, but scientists study animals' poop to know more about their health, DNA and behaviour. I'm glad those were the ones that aren't interactive. Just visual. 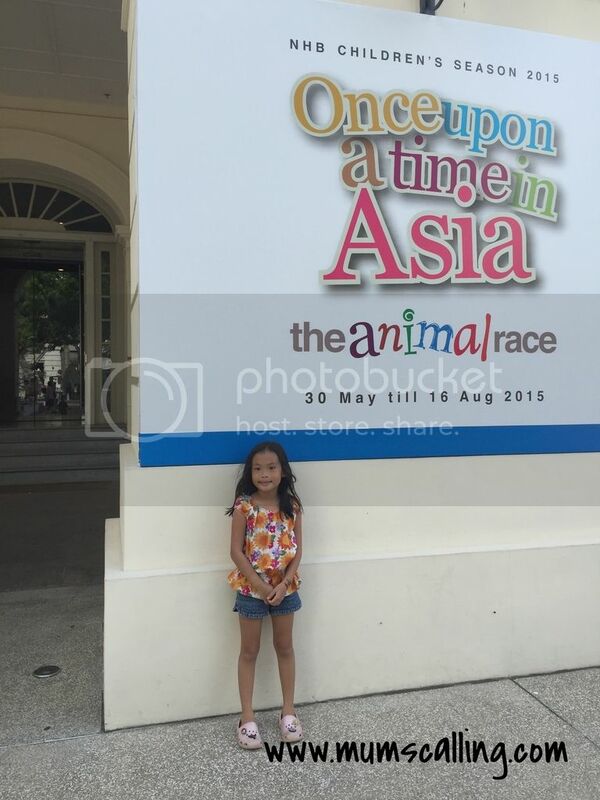 Once upon a time in Asia: The Animal race exhibits from now till 16 Aug 2015. We had a very short visit that day, as a big part of the Museum is under renovation. Hopefully, all will be up in big scale soon! If not, the animal exhibit is actually quite an interesting one. Have a frugal fun filled weekend ahead! Recharge and refresh for the school term again, next week. Don't forgot those last minute assignments that has to be completed for school too. FREE admission to all Singapore citizens and PR (Bring identification along). June is always a very hot-citing month for outdoor events. We had a fun-filled event over at Aviva Superfundae. Like what its name suggests, we did have a day of fun! Weather was crazily hot, but we were glad to be battling with the sun, not rain. At the entrance, we were very warmly welcomed with goodie bags and the kids got to choose a toy of their choice in addition to their goodie bag. Nerf guns excited them. The bag was thoughtfully packed with a picnic mat, umbrella and wet wipes! The very essentials for a hot day on a lawn. We were spoilt for activity choices once entered. There were so much to do in our seemingly little time. Boredom did not hit us for a single moment, the kids were very well engaged all time. We collected stamps for every activity we do, and completing the card game it allows us to exchange for a little toy at the redemption booth. We did the matches and dashes before cooling off to the arty and crafty work. We did the milk and beer dashes. Oh yes, something for the adults too. Which of course, the man and I consumed the alcohol left in the cup, after the dashes. It was surprisingly, the most thirst quenching drink under that sweltering heat. The kids had their hands on the crafty works, which they very much enjoyed. We were simply thankful that these crafts were housed under a prop up tent, which was a thoughtful shelter and also a good hide from the sun. And I heard nursing Mums got to nurse in an air-conditioned area! So wonderful. Js really enjoyed their time in there, every single moment of it. I thought the really exciting part was catching hold of gummies from the candy cannon that pops every hour. We collected and were generously gifted so much gummies that Js brought it to school for distribution. We had boxes of it! I attempted to paint too! The fun was physically exhausting, it sucked so much energy out of us that I thought we should end the day early. But the ever high energy kids decided that they should stay out, under the dark open sky for a movie. Oh well, what could be better than movies under the stars. We stayed on. Got dinner there and laid out the mat. It was a very awesome day! Probably one of the best carnival we've been to and perhaps, paying a fee for events like this can be worth it at times. There were no swelling crowd, no snaking queues and just so much good play. Candies were flowing, ice cream was free and toys sent little ones beaming with smile. It was a land filled with excited kids. I do hope #Superfundae will make a come back next year! Disclaimer: Media invite. All photos and opinions are solely ours. Dads like when the kids run to the door and warmly welcome him home with a cuddly hug. Dads like coming home early, just so he can still catch a bedtime story with the kids. Dads like listening to the good progress reports Mum submits daily. Dads like coming to the dining table, to eat with well-behaved kids. Dads like being greeted by happy children before he sets off to work. Dads like how well the finances are managed in the home. Dads like sharing their wisdom generously. Dads like staying cool in midst of panic mode . Dads like their private moment when it's soccer time. Dads like coming back to a neat and clean home. Dads are like our bosses and superheroes! Here's Js pleasant surprise for their Dad, a bagful of creatives for their Super Daddy! A good mix of crafts made from school and home. Jazz did palm painting and led her brother into doing a 'turkey' (bottom right). It does take a little imagination to decipher that. Jazz said turkey signifies thankfulness. So yeap, they are really thankful for their Daddy! I held the significant role of keeping these crafts out of the man's sight, till they were ready to be presented. I'm thankful for these crafty kids (in a good sense), and hope they'll continue to delight the people around them with their handmade works. In midst of doing these crafts, Jazz complained that she hasn't got time to work on anything for her Daddy since she's been in school all weekdays and out over the weekends. Though more of a time management, she did strike a cord in me. I will pick them earlier from school! "Happy Father's Day! Thank you for being their awesome hero!" 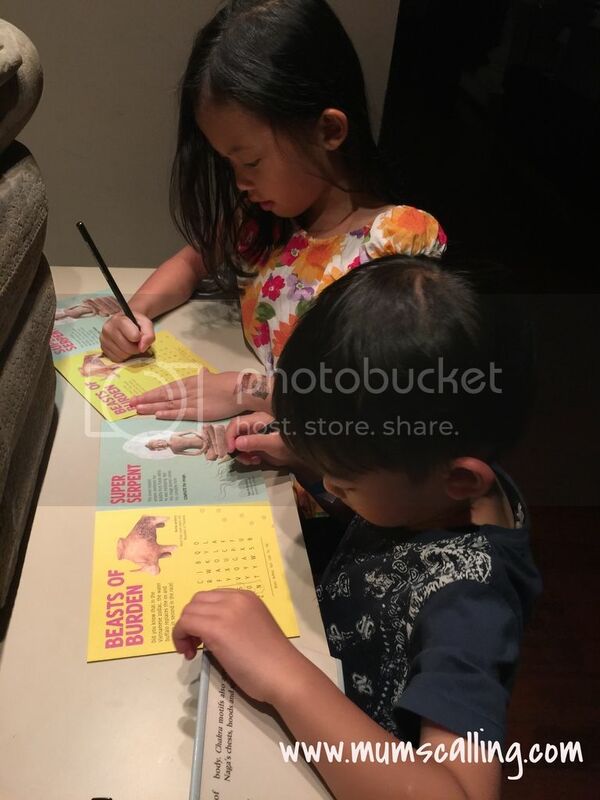 Introducing our adventure into the Peranakan Museum! Upon letting Js know our agenda, we had an extremely hard time explaining what a Peranakan is. It's not like an object or an expression that they can easily comprehend. We spared no effect explaining though. The word Peranakan means 'descendant' or 'child of'. Used to refer to people of mixed ethnic origins. Chinese peranakans are the majority, but there are also peranakan of other ethnicities. During ancient times, travellers stayed and put down roots over the Southeast Asia crossroads. They married local women and their descendants are called Peranakans. Our Peranakan Musuem showcases the finest and richest collection of Peranakan art and objects. Very much exhibited to our local history. We were very wow-ed when we entered the Museum. It was elegantly built on the outside and inside. Standing glam with 3 levels of 9 galleries. Extremely impressed too, with how well-kept the place is. Learn about its origins and perceive a better understanding and history of who they are. There is also a short video playing repeatedly, about its origin. Explore the traditional Peranakan wedding and take a peek into their wedding chamber, which is very much skewed towards the olden days of a Chinese bedroom chamber. A wedding celebration of 12 days is most definitely interesting and exciting to know about. Enter further into their language and fashion influenced by life in Southeast Asia. Pick up the nostalgic phones to listen to the recordings of Peranakans' conversations from the oldest days to 1975. You would notice, as the years progress, the Malay language diluted much to be fully conversed in English. It was interesting to hear them out. Learn also about their religions, public life, food and feasting! I love Peranakan food. So much so that we ended our night with a Peranakan feast after that visit. We saw too, the very beautiful and colourful nyonyaware porcelain used to serve their delicious dishes. In one of its gallery (gallery 7), do note it's where they display death rituals and mourning with funeral setting. Avoid entering if you don't feel comfy. It did get a little spooky for me, but Js were fine. 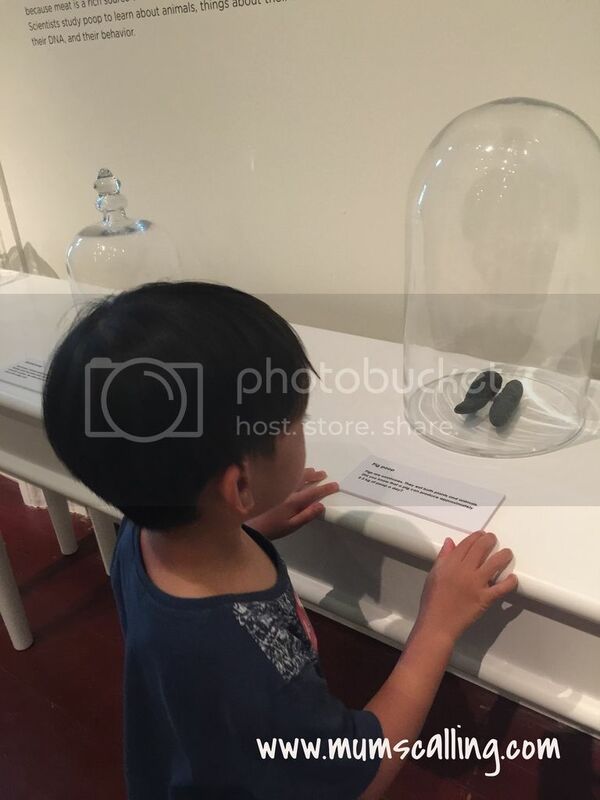 We also spotted various contributions from Mr Lee Kuan Yew's family to the museum. Mr and Mrs Lee's barrister wigs were on display for public viewing. There's was also a display of cheongsum worn by Mrs Lee during Mr Lee Hsein Loong's appointment ceremony as our Prime Minister. Yes, they are a family of Peranakans. You would realised too, many local streets were named after a couple of remarkable peranakans from the past. It was overall a very good experience and learning journey for us. Remember to register and get an activity sheet at the reception when you enter. This activity sheet is gonna keep your little ones looking forward to the different galleries, to collect 8 auspicious symbols embossments. I also love how the Museum created some interactions by casing up selected displays for us to touch and feel. Enter into the world of Peranakans soon! The best time to visit would probably be the second Sunday of each month, which they call it Straits Family Sunday. A family event of different theme every month, to keep you and your family well engaged. Don on too, batik shirt and sarong kebaya for a Peranakan moment. 12 July: Bead by Bead. Find out more about their beaded artworks and create a unique craft inspired by this collection. 09 Aug: Supersized: Majulah Singapura. Join their guided tour and make craft inspired by their collection. 13 Sep: Mythical creatures. Join the guided tour, hunt for mythical creatures and make craft inspired by them. Redeem meet and greet pass with minimum spending of $50 in single receipt. Various locations at 4pm time schedule. 7pm at Event Square Stage. Check link above. Free admission for all OR shoppers can also redeem a Gold Star ticket (for 2 pax) into the exclusive Gold Star area when they spend a minimum of $150 and enjoy tasty delights. Learn more about Dr Sun Yat Sen and the Chinese culture. In conjuction with dumpling festival, visitors can learn about the festival through a series of games and craft activities. Try your hands at the dumpling making booth, do craft and participate in the "Dragon boat race"! The International Music Day is a tradition that started in France and now celebrated all over the world to enable music enjoyment for everyone. SWS City Swing has prepared a repertoire of swing jazz and pop music coming from a wide range of diversities including French, Chinese, American, Indonesian and many others. 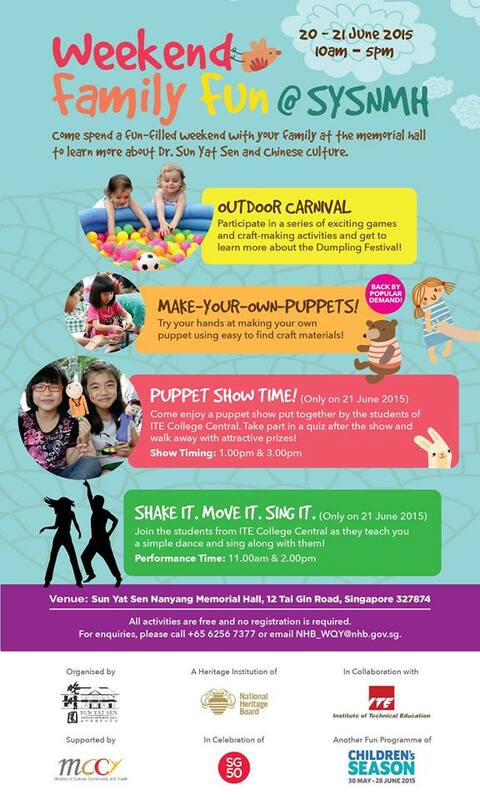 Join Singapore's first costume crafting festival where children craft and star in their very own superhero film. Sign up for the various creative workshops programmes here. Event schedule here. The second annual Read! Fest is here too. Click on link to find out the activities at various libraries within your nearest heartland. Have a frugal and fun-filled weekend ahead! National Museum is the 'in' thing these weeks! Here we go, onto our Frugal Friday's list too. We know It's the Children's Season, and there's no better place to be in, other than museums! So what's up in the National Museum, together with Masak masak 2015?!! Inflatable playgrounds of the mosiac playgrounds found in our heartland during 1970s and 80s. A little outdoor play area nostalgically set up for little kids to have go on. A spectacular display of origami flowers, animals, big and small. With a little donation, you could get their materials for some hands on folding and colouring. After which, you can put up your creation onto the wall, among with the many others. In the same room, look out for the puppetery performance if you're visiting over these weekends. An enchanting tale of nature, Queen of the forest, by Jermey Hiah. We moved out to the concourse area for some nostalgic hands on games. Remember the eraser flag game we used to play in school? We spotted the giant sizes here and taught the kids how to play. Jare got so hooked that he didn't want to leave that station. You have to ensure that your opponent's eraser is totally pinned down to qualify a win! Masak masak displays till 10 Aug 2015. Visit the memorial exhibition of Mr Lee Kuan Yew. We had a glance at his red box and read the chronicles about his life and his political career. Memorial Exhibition till 28 June. We shared about our PLAY experience mid last year when it first launched. A visit back this year looked almost the same, just that some props and free to play objects were almost worn out. Guess there were just too much rough handling when it comes to excited kids. Oh well, our museum is free for all and a non-profit attraction. Would be nice to remind our kids on being kind to its belongings. 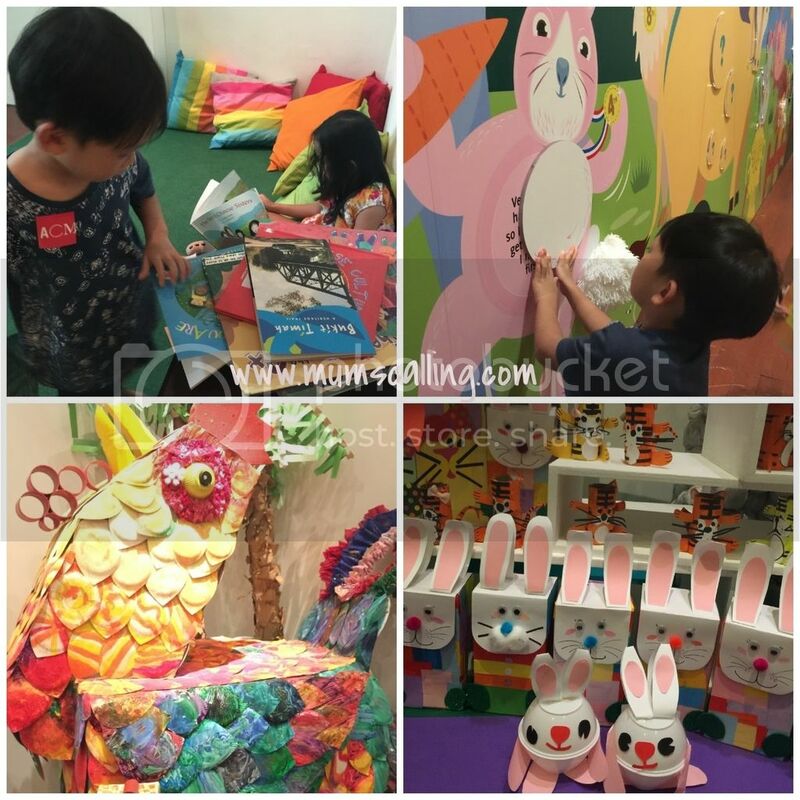 Craft workshop where kids can personalised their own TV to feature their favourite cartoon. Bring that TV box to live with their own illustrated stories! Register early on site. Limited spaces. 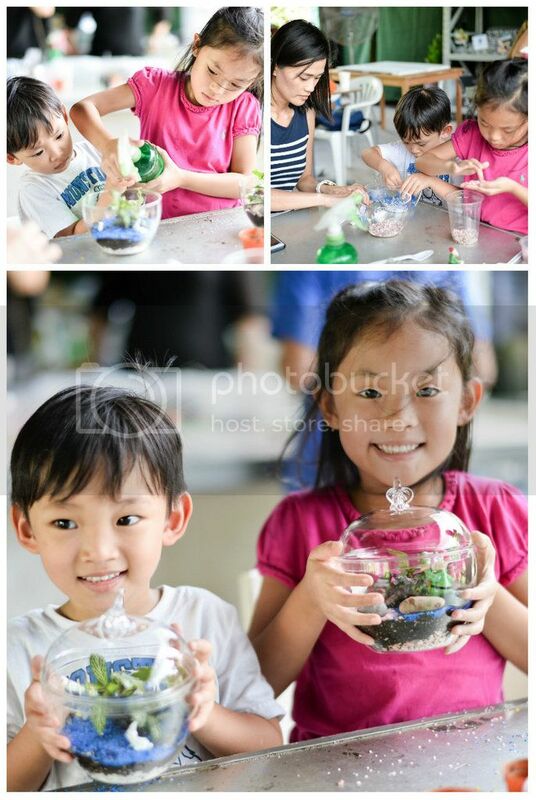 Tap on the naturalistic learning - smell and touch flowers, fruits and plants. Learn about these ingredients in our food, its colour and spices. Discover too, the benefits of plants and create your own 'tree'. Register early on site. Limited spaces. We we turned down for being too on time. And so when we were there, we realised there were more time slots to just those listed on their website. For your info. After all the fun, we travelled back time to its basement, where we turned time back to Singapura, 700 years ago. We sighted and read about Singapore's transformation from a fishing village to what it is called a clean and green city today. The exhibition went from its Archaeology to its independent. Rich history within! Get inspired by the storytellers as they bring the kids through an enchanting, dramatic and interactive tale session. Register early on site. Limited spaces. You may also download the activity sheet here. 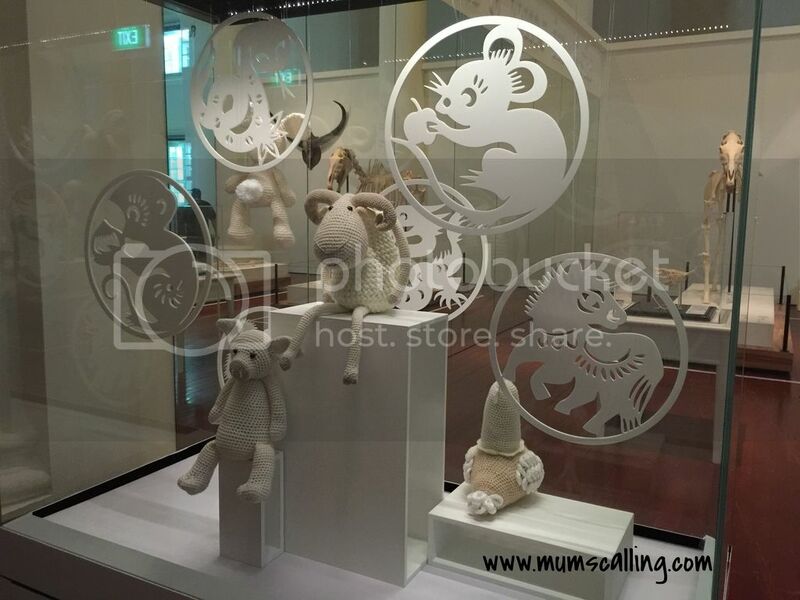 Singapura: 700 years exhibits till 10 Aug 2015. Before entering or after exiting the exhibition galleries, be welcomed by the Wanderlust adventure exhibit, created with the simplest material such at plastic bags! Js had a great time tunneling in and out the structure. That was our final stop before we decided to leave. And of course, don't be in such a hurry to leave. Our national museum is one of the best places for pictures, at least to us. I had my wedding pictures taken there 9 years ago, and so it's more photo moments whenever we set foot there. Visit the National museum soon, if you've not. Singaporeans and PRs enter for free! Other paid workshops include, Shadow puppetry, where kids can create their own story using puppetery. Tickets can be bought over at sistic. Have a go at giant inflatables in the junior zone, creative sports try-outs, Laser Tag and walk-on-water for the more adventurous. Coupled with light shows and artist performances, the carnival is the perfect option to complete your 28th SEA Games experience. Singapore's biggest water festival takes place at Marina Bay. Includes performance, flea markets and a tent with activities for children and families too. Event schedule here. Move and dance to the beat of yesteryear enjoyed by young peranakans of the past. Create your own container inspired by old gramophone and vinyl records. Redeem a workshop if you are shopping or dining within Raffles city. Minimum spending of $30 in single receipt. Dive into the underwater world of SpongeBob SquarePants, best starfish buddy Patrick, Krusty Krab's nemesis Plankton and Patchy the Pirate. Redeem meet and greet pass with minimum spending of $30 in single receipt. What's up at City Square Mall this June? Barney fans should not miss the opportunity to get groovy to a super fun live show with Barney and Friends! 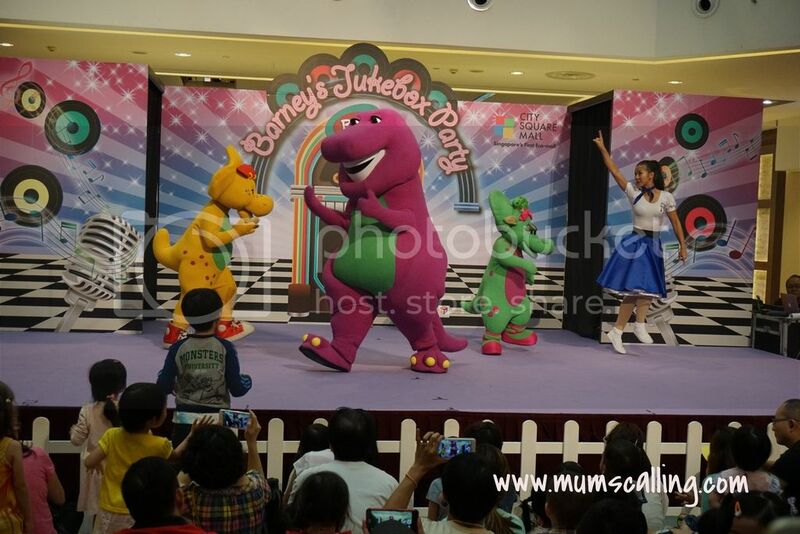 A retro-themed performance, Barney's Jukebox Party is bound to get your little ones shaking and bouncing to the songs. 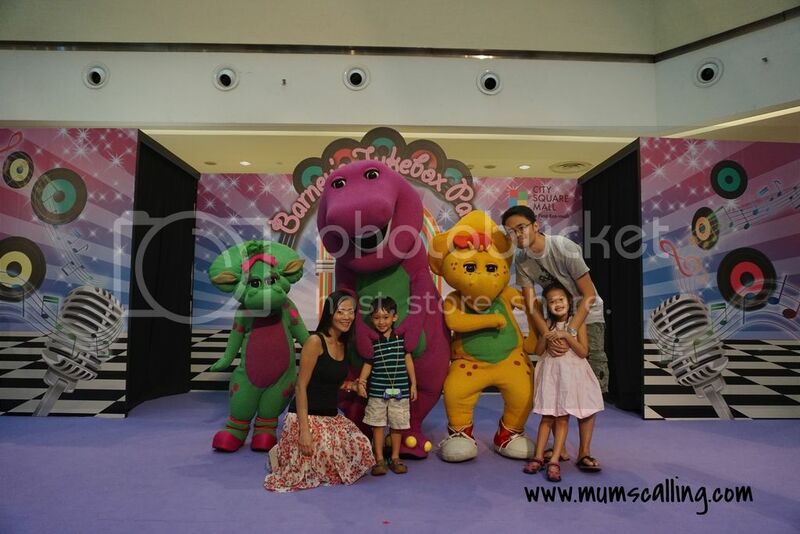 We met and greeted Barney and his friends, B.J. and Baby Bop last weekend. They entertained us with a couple of songs including, "The wheels on the bus" and "Itsy Bitsy spider". Always a familiarity to Js. Though Jazz seemed to have outgrown the Barney era, Jare is still very much in love with the purple dinosaur. He couldn't get his eyes off it! Rock and roll with Barney! You know, Barney, Thank you for always singing "I love you, you love me... " at the end of your every performance. It gave us that extra opportunity to plant our kisses and do cuddles. A very good end to every of your show. 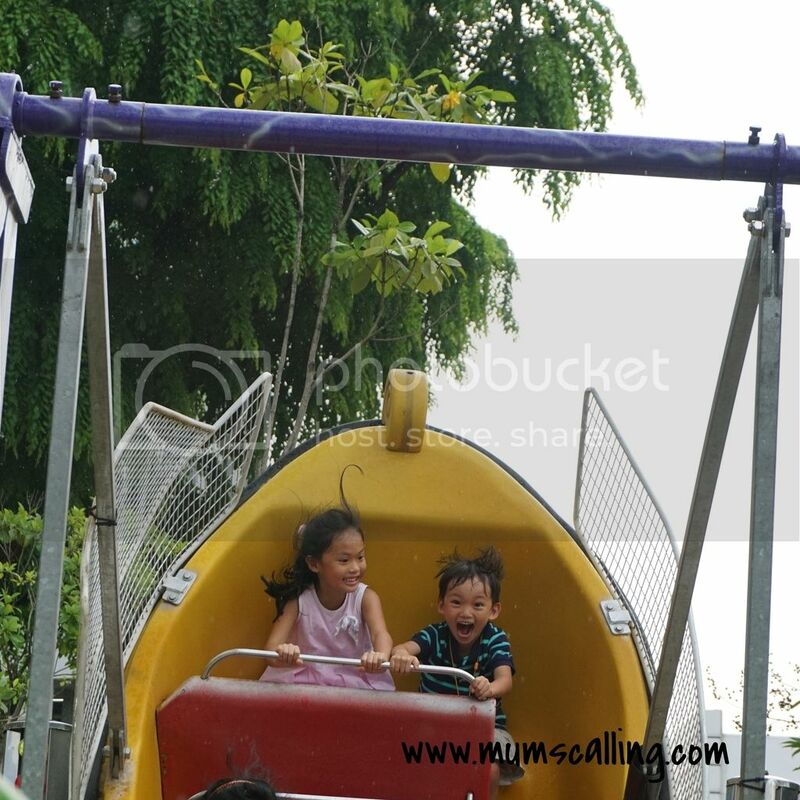 The nostalgic fun does not end after the performance, head on out to City Green park for exciting activities, the "Good Ole Fun in the Park" retro carnival will hype the kids' day with games and rides such as pirate ship, carousel, bumper car, tea cup and more! Js had a go on the pirate ship and they love it! As described by Jare, his tummy always rumbles on it. Love their faces of excitement! There is just too much fun stuff this June holiday. Get a Barney date and time set in your calendar soon! Redeem a meet and greet pass and a carnival ticket with minimum spending of $60 (Max of 3 combined receipts on same day of purchase). Limited to 50 passes per show. For children 4 years old and above. Redeem a cookie pass with minimum spending of $100. (Max of 3 combined receipts on same day of purchase). Limited to 40 passes per session. Remember to redeem these passes an hour before each session begins. Shop fast before passes run out! You may however, choose to only redeem the meet and greet pass or cookie art session. See what your little one prefers. Tickets to games and rides may be purchased on site. Redeem a retro-chic foldable umbrella with a minimum spending of $250 ($350 if inclusive of NTUC Fairprice receipts). Shoppers can also purchase $50 worth of City Square Mall vouchers and receive additional $5 shopping voucher for free. Have fun and happy Shopping! City Square Mall is a very family-friendly mall. Even if you decide not to shop, you will probably end up with something just by looking at the parents and kids' attractive shops. It has bagged many awards for being family friendly. A great mall we love and perfect for any family to be in. Disclaimer: Media invite. All opinions are photos are solely ours. I'm so excited to be unveiling Js room! We showcased it some years ago, and here we are again, rejigged and reorganised as toys, books and clothes collection pile up. Decluttering isn't easy at times. We just can't decide which to go. Here first, their bed of dreams. Good dreams or bad dreams, they sleep on it. But these beds get abandon on weekends, when we'll all co-sleep in my room. 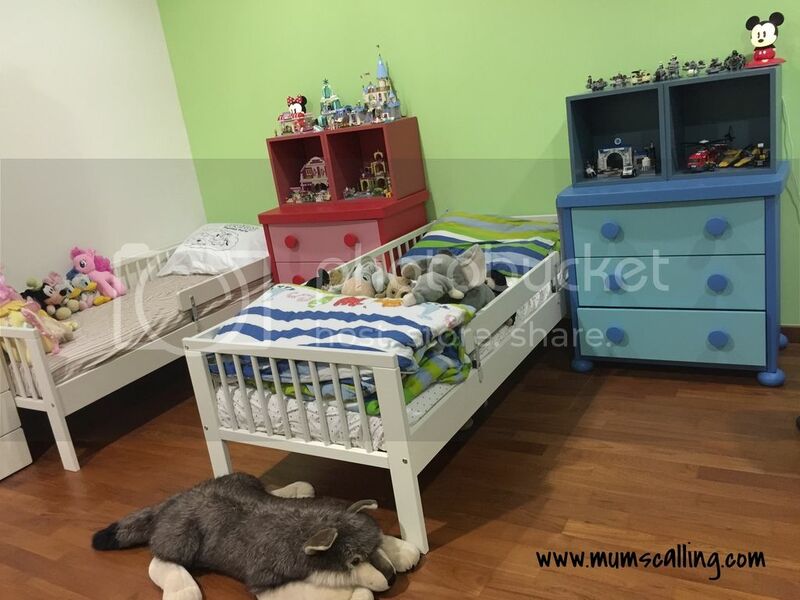 The chest of drawers next to their bed houses their Pyjamas and a mix of toys. For Jazz, Pyjamas and Accessories. A dual role as bedside table, it holds their little night lamp and water bottle for night sip. The square shelves were for a purpose. They are to be drilled into the wall to house their built up lego. We bought them not too long ago, and should getting down to work soon. We started our love for Lego when we could get it cheaply in the states. It got really addictive till space became a disturbing concern. The collection seems endless, perhaps till debt do us apart. Building these little blocks are also the culprit for why Js prefer to stay in during weekends to work on them. Enemy to my exciting weekend plans. Here, a zoom in to their works of display. Jazz has her princessy and Lego friends collection while Jare has got his Starwars and Lego city collection. They really love the process of building it. I thought we should find proper solution to showcase them properly, and so here the square shelves. Some days when we catch a rather scary movie or hear of some bad news, Jazz's fear of darkness creeps in. 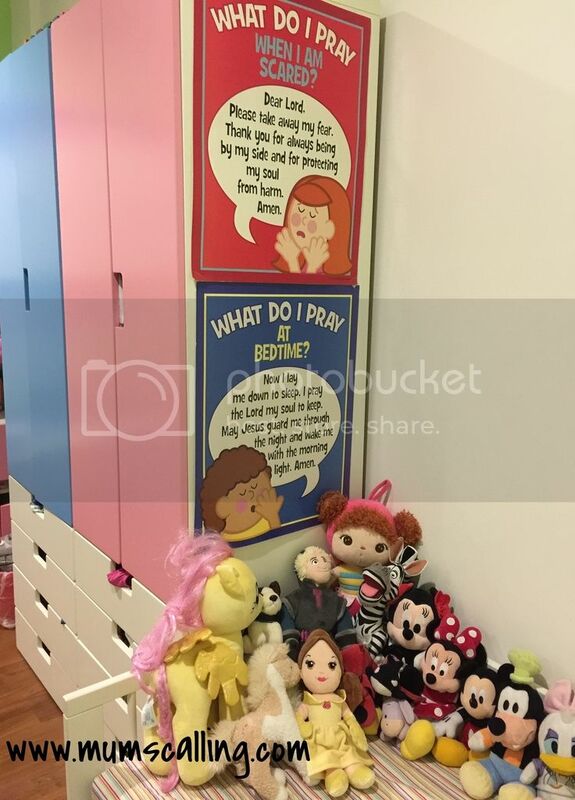 I put up prayer posters (bought from Oriental Trading) in front of her to calm those fears. It's been most helpful and she's so diligent in praying that she dictate them word by word without looking. I should start putting up a spelling list. Jazz's bed front is also facing the wardrobes. Then we talk about the more serious stuff, reading and writing! 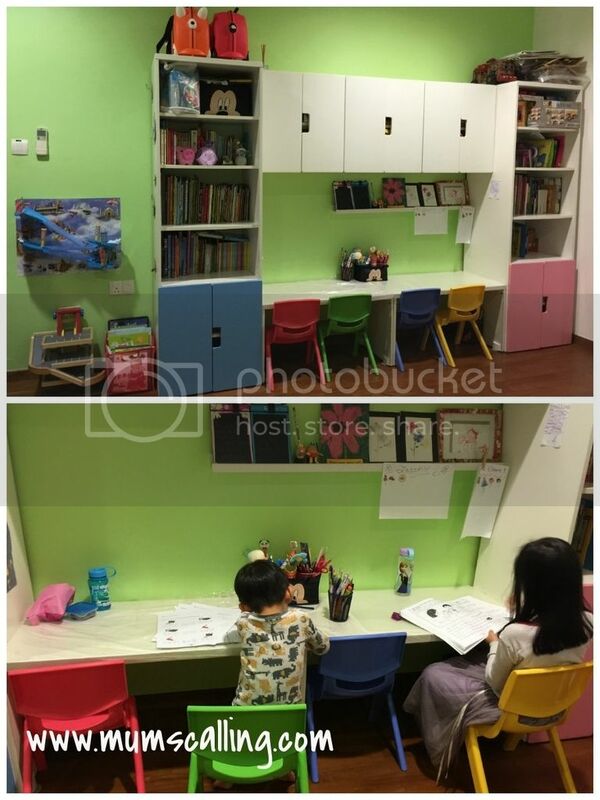 My friends always joke that I own a tuition or childcare centre, but I think the number of chairs and layout are just perfect. I keep the kids apart while I teach, I sit in the middle and if the man decides to join the education department, he has got his seat too. While I give a piece of work to one, I'll teach the other. When my teaching is completely done, we'll have silence to work in clarity. Only disturbance is when I do reading with Jare, Jazz finds it a little distracted. My stories are always captivating, can't penalized her for that. Heh. We'll try though, not to coincide if she needs concentration. When we started doing the kids room, we knew it was a battle of pink and blue. We had a green wall to stay bright and neutral. For the furniture, we knew it has to come in pair. A pink and a blue. I love having storage to keep unglamorous stuff out of sight. Which I gradually realised these cupboards are too quick to utilise. Toys after toys are spilling out of its allocated space. We have to put a STOP to toys shopping. Till we find that empty space again. Yeap, so that's a peek into Js little all-in-one room. I wished I could say Ikea sponsored their furniture, but good things ought to be shared. They do have beautiful kids' furniture at a decent price. I don't think we need a very long standing furniture, so price factor is crucial. In years to come, just a couple more years, Js will need their individual room and space. Not quite looking forward to that actually. How did you create your small spaces? I hope you took some pictures for keepsakes too! 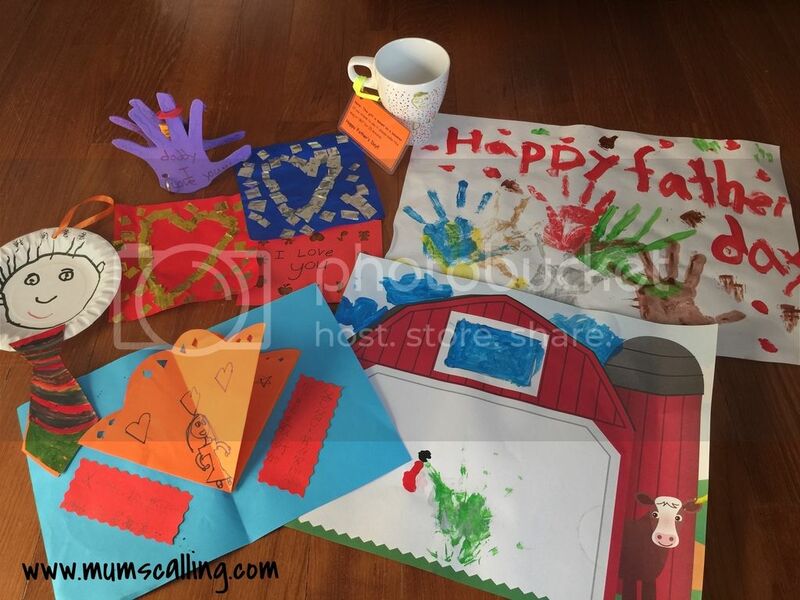 This post is part of the Small Spaces blog train, which is hosted by Mum in the Making. Click the button for a look at more small spaces! Next up, we have Susan to share her Small Spaces. Susan is a full-time working mum who find that there are never enough hours in a day. 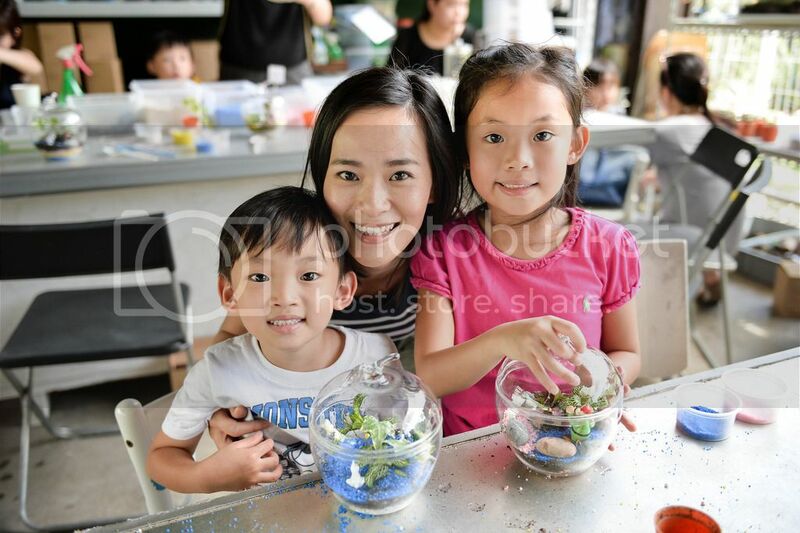 She finds herself juggling between family and work while being a nurturing mum, loving wife and a career woman. She blogs at ajugglingmom.com and hopes to inspire other mothers to lead happy and fulfilled lives.